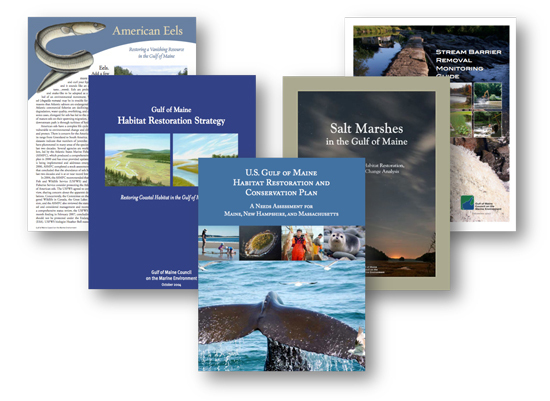 Since 2002, GOMC’s Habitat Restoration Program has contributed grant funding and technical assistance to 120 projects in Maine, Massachusetts, New Hampshire, New Brunswick and Nova Scotia. Our projects seek to reverse impacts to impaired coastal wetlands and streams so they can once again function as ecologically diverse and economically supportive natural systems. We use proven restoration methods that consistently lead to successful outcomes. The benefits of our projects extend not only to high value species and habitats, but they also provide local engineering and construction jobs and lead to conditions supportive of outdoor recreation and tourism opportunities. About half of our projects support engineering necessary for construction projects or field studies to determine where restoration investments are best applied. The other half fund construction projects like stream barrier removals, fishways and other “on-the-ground” restoration activities including planting of riparian areas, eelgrass meadows, and shellfish beds. 1 These figures underestimate GOMC’s restoration impacts because they don’t capture habitat gains that were facilitated by engineering studies or assessments we’ve funded. 2 Stream mile estimates are conservative because they assume that most road crossings upstream of project sites are barriers or partial barriers. In addition to supporting the planning and implementation of restoration projects, GOMC’s development of restoration tools, methods, outreach and regional strategies increases awareness of habitat needs and promotes the use of rigorous practices for practitioners. As a result, GOMC plays an important role as a consistent regional leader and a steadfast partner to both organizations new to the field of restoration and those with more experience. For the full list of the Habitat Restoration Committee, click here. For a brief on the Habitat Restoration Program, click here.